Among Mid-Century furniture fans, the work of Charles and Ray Eames is paramount. But because their designs were so widely copied, recognizing an original – and collectible ­– piece can be tricky. We spoke with Richard Wright, director of the Wright auction house and specialists in the Eames’ work, to garner some tips on identifying legitimate Eames furniture and how to evaluate its worth. The most valuable Eames pieces date from the first decade of production: 1946-1956. But pieces from the later ’50s to the early ’60s can have collectible value, too. The good news is “a lot of the work is signed,” Wright says. About 70% of the pieces had paper decals, so the first thing to look for on the underside of a chair or table, or the inside a cabinet drawer, is a sticker (or the remnants of one). “Not being marked doesn’t mean something’s a fake,” Wright cautions – labeling was a little loosey-goosey in the early years – but it’s a good start. Objects made with molded fiberglass, like the famous bucket and shell chairs mid-century furniture collectors clamor to own, often have decals bearing the name “Zenith Plastics” still intact. Another name to watch for: Tigrette, which made the Eames line of toys. 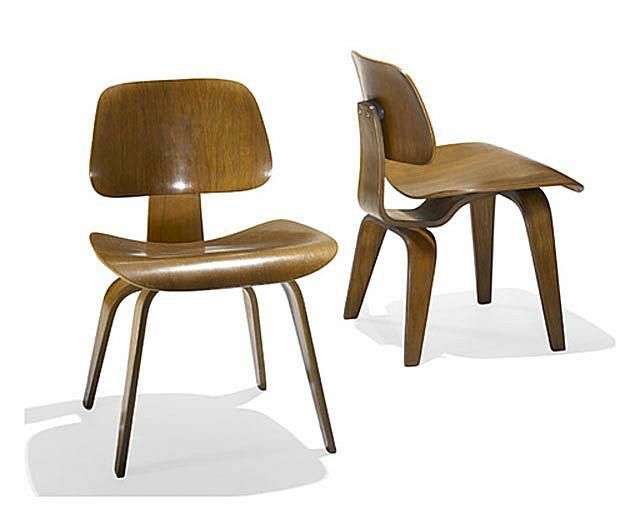 On wooden chairs, tables, and recliners, the sticker often includes the name “Evans” – the Evans Product Company manufactured the plywood the Eames used so artfully. This shouldn't be confused with mid-century designer Paul Evans. Looking old is one thing, but – as with any antique or collectible – condition does matter. And the more original that condition, the better. Even such details as for whether the screws on a piece have ever been loosened can affect a piece’s value. (“Some Eames collectors do get into minutiae,” Wright allows.) Some repair-oriented changes – such as new rubber feet tips or shock mounts to replace dried-out or cracked ones – don’t matter that much. Still, perfection commands a price. At Wright's recent Eames auction, the storage unit, left (a nice, but not especially rare model) in completely original condition fetched $15,000. If it had been refinished, or altered in any way, it would’ve gone for only $5,000, says Wright. Because they were mass-produced, there are a lot of examples of Eames furniture out there – so, many items are not extremely expensive (at least, by antique furniture standards). But some models were less common than others. So, in terms of pricing, “it does become about rarities,” Wright says. At his auction, the chair pictured left fetched $2,000 – while a pair of similar ones, the same model from the same year with the same sticker and in basically the same condition, collectively brought $500. Why? “It was all about the Harlequin-pattern upholstery” on the first chair, explains Wright – an unusual decorative feature, with “a really nice vibe.” And, needless to say, in near-new shape. As with any area of collectibles – if you’re serious, study the field and educate yourself. Many museums feature Eames pieces. There’s no shortage of literature about the duo; Eames Design: The Work of the Office of Charles and Ray Eames by Marilyn & John Neuhart and Ray Eames (Harry N. Abrams, 1989) is “definitely the Bible,” Wright says. The website www.eamesoffice.com, run by Charles’ grandson, is also a valuable resource and currently working on a catalogue raisonné of the Eames canon. The Herman Miller website, www.hermanmiller.com, has a timeline and other information about the Eames.